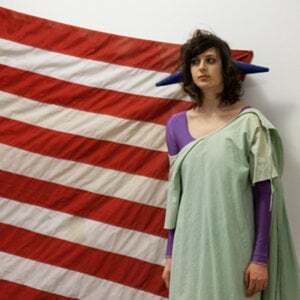 Juliacks is a trans-media artist, director, writer, producer, performer and event designer creating narrative universes using the mediums of filmmaking, multi-media performance installations, comics and theatre in North America and Europe. Narrative and conceptual interests combine and reside in, exhibit, perform, and screen in different settings. Since 2009 upon her arrival in Finland with a Fulbright Fellowship in performance art, she has been developing her stories and artworks inter-culturally and has has been supported by numerous fellowships and residencies in Europe and North America in Finland, Sweden, France, Canada, Denmark, Italy and the United States. Currently Juliacks is an artist in residence at De Ateliers in Amsterdam where she is completing the comics album, Architecture of an Atom (a series of paintings that are also comics) and a final ‘epilogic’ performance that is part of the eponymous transmedia universe. Her films and performances have been shown at museums (Moderna, Musee d’Art Contemporain de Lyon, Centre d’Art Contemporain de Geneve, Kiasma, Andy Warhol..) at film festivals, (Zinebi, Antimatter, Lisfe, Cine-Rebis,) galleries (Silberkuppe, Le Salon de Montrouge, Co-Prosperity Sphere, Nurture Art, Néon, Synchronicity Space, ) comics festivals (Stockholm, Lisbon, Helsinki, Crack, Brooklyn,) alternative art/music spaces (GrrrndZero, Ptarmigan, Atomic Center, Flausina…) and abandoned/altered spaces (a warehouse for special effects/a refurbished generator/a neglected lot). Her books, Rock that Never Sleeps, Codas, and Map have been published by Sparkplug Comics and the Moderna Museum respectively. Most recently her work has been published by Seven Stories Press in the Graphic Canon vol. 3 and children’s literature, Insect Bath Horror Comix Anthology edited by Fantagraphics, ZeroQuatre a contemporary art magazine of the Rhone Alpes region, Washington Square Review a literary journal and in Spectres by Kutikuti a Finnish Comics collective. Her books, Swell and Invisible Forces have been published with the support of grants and project-based residencies. The first part of Swell received an Ignatz Award Nomination for Most Outstanding Mini Comic. In 2012, the play Swell, adapted from Juliacks’ graphic novel of the same name, premiered and headlined at Culture Project’s Women Center Stage Festival in New York City in a collaboration with theater director Kathleen Amshoff to reviews in the New York Times, and the Huffington Post. This play then traveled to the Atomic Center in Winnipeg, Canada.